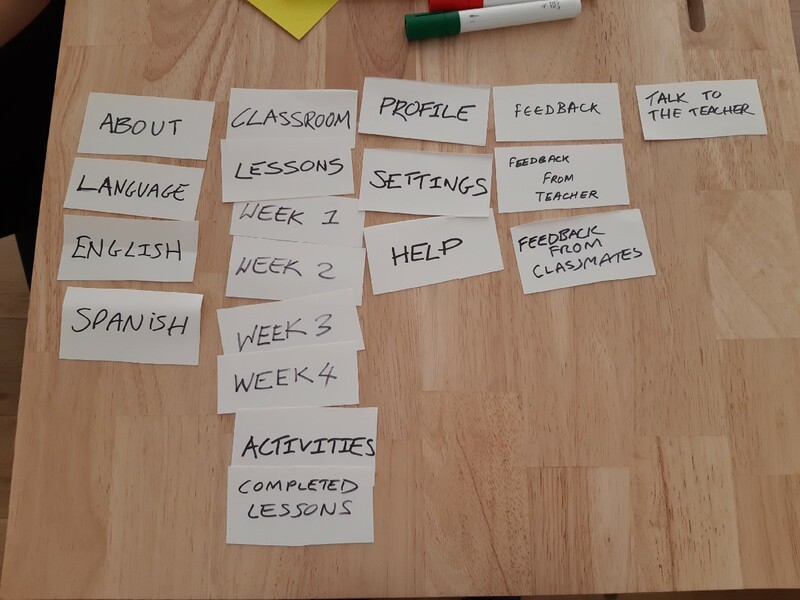 In the third week of Ironhack UX/UI course, we had to design a feature for Smart People Inc. an educational company which offers in-person language courses (Spanish and English). Smart People Inc. needs a way to provide an engaging online experience for students that cannot attend the summer camp. Research- We started with online research since we didn’t have access to teenagers we did not perform an online survey but spoke to a couple of teens. With online research, we had few insights. Parents wanted their child to learn something and not just have fun during the break. But due to the high cost and unavailability, they can’t send their children to camps. Also, the children don’t get motivated enough to learn a new language all by himself. The user needs encouragement to keep up the pace with the language and can practice the language learned. 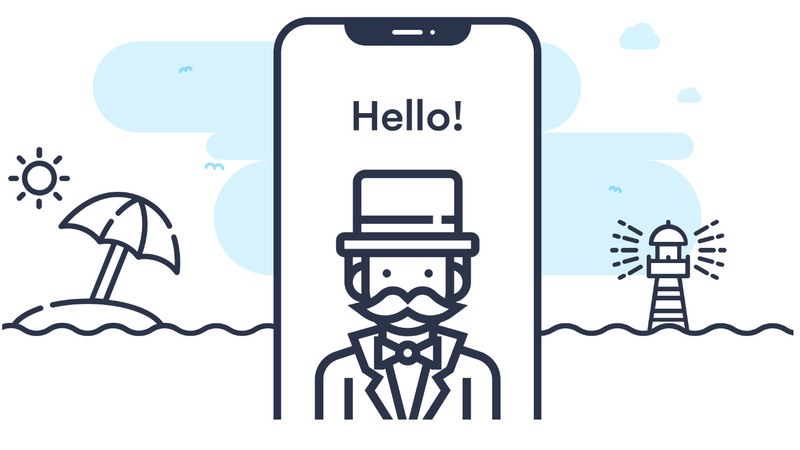 Competitor Analysis-We did market analysis and found out few already existing app like Duolingo which is free and has fun content and interactions but then we wanted a feature where the user can feel like he is participating in a group and is learning at the same time. Problem Statement-HMW make self-learning more fun, inclusive and engaging? 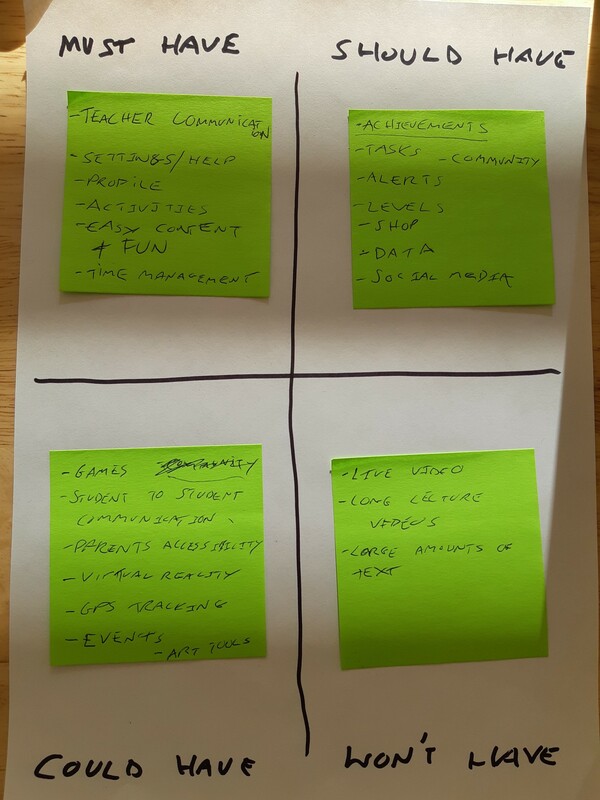 Empathy- To empathize more about the pain points we came up with the user persona. Our User Mat is a young teenaged 17 years. 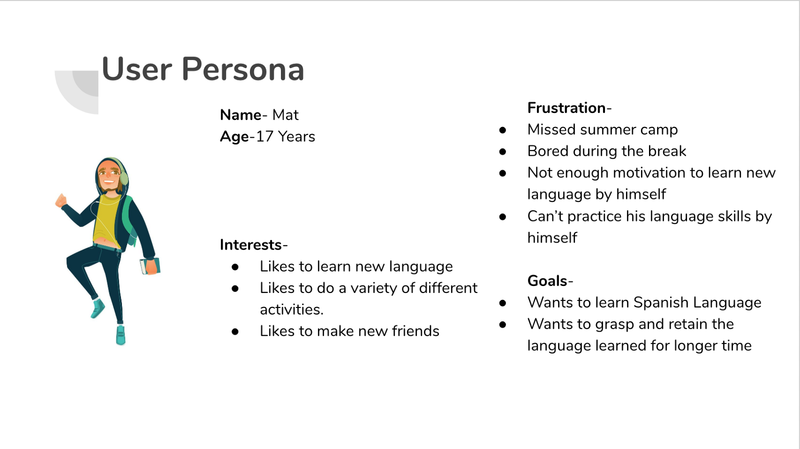 He likes to make new friends and is interested in learning a new language. But then he couldn’t go to the summer camp and is now missing it. He wants to learn Spanish but is not motivated enough to learn by himself. Product Mission- To find a way where the user can learn a new language without being bored and enjoy the feeling of being in a camp. Ideation-While ideating we came up with many ideas one of which was live sessions to give them a touch of camps. After brainstorming and we decided to design Live Quiz which will be on real-time during the 4 weeks of Camps duration. Where all the campers(users using the apps) will vote for their favorite topic and the Quiz will be based on the most voted topic. Once the quiz will be over he can check the scoreboard and can also check the answers. He can share his results on social media. With the card sorting, we came up with the sitemap. We struggled there a little bit because everyone was having their own way of grouping them but we overcame it by trying closed card sort and that gave us the correct direction. 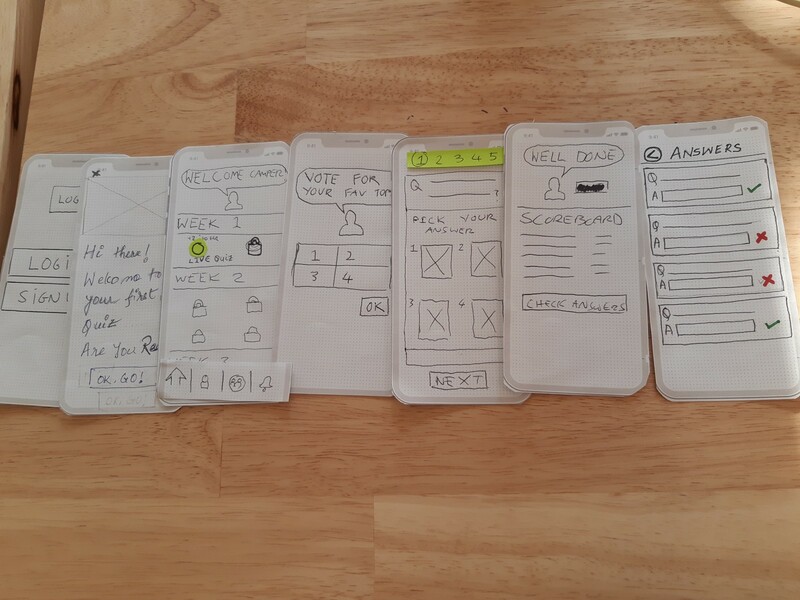 With the solution in mind and sitemap done, we began with the low fi and then the User testing which is my favorite part, we found that our screens required few corrections and then we iterated the process and the finally moved towards the mid-fi. So, this Live Quiz on teen’s favorite most voted topic will give them a sense of companion and hopefully they remain motivated to learn a new language! !